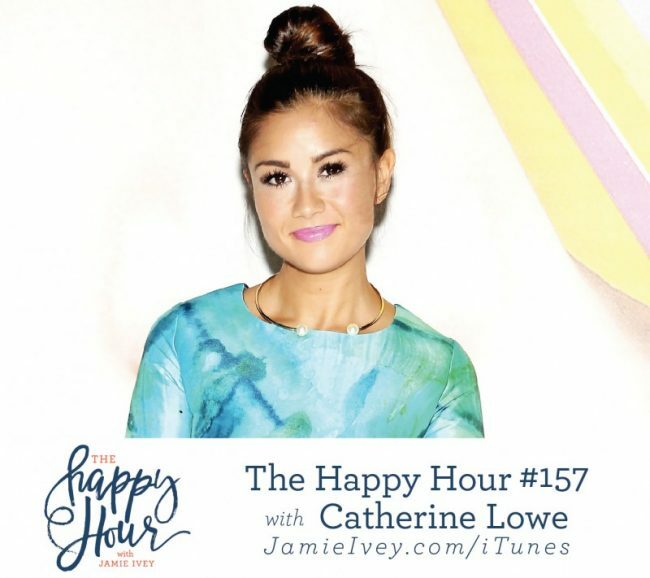 My guest for The Happy Hour #157 is Catherine Lowe. You may recognize her from a little show called The Bachelor. Catherine met and fell in love with her now husband, Sean Lowe, on season 17. Millions (self included) tuned in to watch them tie the knot on national television in 2014. They now live in Dallas with their adorable son, Samuel. On today's show, Catherine and I visit in person and cover so very much. We cover all things related to The Bachelor - how she was casted, her journey of falling in love and getting engaged while the world watched. She gives some behind-the-scenes scoop - like how you might find some of the women doing Bible studies, instead of running around in their tiny bikinis. But, somehow, that kind of drama doesn't make the final cut. Catherine shares about how difficult it was transitioning from finally being publicly engaged to watching her fiancé dance on Dancing with the Stars. You'll love hearing her story of following Jesus, after Sean made an 11th hour visit to her hotel room the night before he proposed. As a bonus, we also talk TV and movies, and what it's like to have an angel for a mother-in-law. You are not going to want to miss this show.